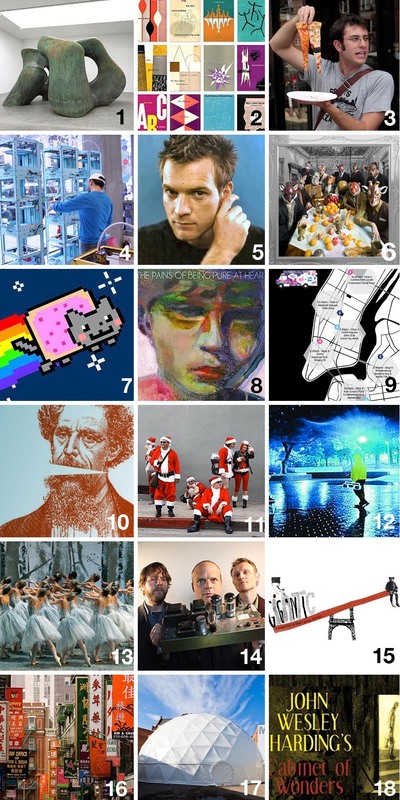 This weekend’s picks for free and cheap things to do (12/14 to 12/16) in NYC. Cultural events in art, architecture, music, film, dance, theater, design, walking tours, food, and fun! 5. Film/Talk – A Conversation with Ewan McGregor interviewed by NYTimes’ Melena Ryzik. Fri 12/14, 6:30 to 8pm. $35. 8. Music – The Pains of Being Pure at Heart at Brooklyn Night Bazaar. Fri 12/14. 9. Food – Free Momofuku Milk Bar cookies from the roaming Holiday Cookie Truck and pastry chef Christina Tosi w/her mom. Sat 12/15 from 11am to 5:30pm. See locations. 11. Fun/Goofiness – SantaCon. Put on your Santa suit and roam (and drink) with hundreds of others, hopefully bringing good cheer to all and not trouble. Sat 12/15 at 10am. Follow @SantaCon on Twitter for locations. 13. Dance – ABT’s The Nutcracker. There are $25 to $35 tickets available (and up, of course) at BAM. See showtimes and tickets here. All weekend. 14. Music – Medeski Martin & Wood. All weekend at the Blue Note. $30 tickets at the bar. Check showtimes. 17. Art/Multimedia Performances – Sunday Sessions Pier Paolo Pasolini: Intellecttuale, Sun 12/16, 12 to 6pm. $10. Ann Hamilton’s The Event of a Thread participatory installation all weekend. $12. Be sure to check back for updates and peruse previous COTC posts for some additional ongoing events. This entry was posted in Architecture, Art, Event, Film, Food, Fun, Graphic Design, NYC, Stuff We Like. Bookmark the permalink.